Brian Moriarty, 2006. From GET LAMP. Original one of the editors of the Atari magazine ANALOG in the early 1980s (where he contributed adventure games for publishing in the issues of the magazine), Brian Moriarty played some early Infocom games and resolved to join the company. Getting a job as a play-tester, he soon had the opportunity to author a title in Infocom's fantasy line, which became Wishbringer. This was followed by the ambitious and well-regarded title Trinity, which combined historical reality regarding the history of nuclear science with fantasy. His nickname at Infocom was "Professor". 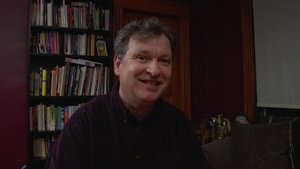 Following his time at Infocom, Moriarty wrote the oft-cited gaming classic Loom for Lucasfilm Games, and has continued to work in the games industry since. Adventure in the Fifth Dimension (publisher: ANALOG Computing; 1983). Crash Dive! (publisher: ANALOG Computing; 1984). Wishbringer (publisher: Infocom; 1985; Z-code). Trinity (publisher: Infocom; 1986; Z-code). Beyond Zork: The Coconut of Quendor (publisher: Infocom; 1987; Z-code). Indiana Jones and The Last Crusade: The Graphic Adventure, Lucasfilm Games, 1989. Indiana Jones and the Fate of Atlantis, LucasArts, 1992. The Dig, LucasArts Entertainment Company LLC, 1995. Loadstar: The Legend of Tully Bodine, BMG Interactive Entertainment, 1995. Lectures and Presentations by Moriarty from his home page. Interview with Brian Moriarty for the Brass Lantern. Interview with Brian Moriarty - posted by Erik-André Vik Mamen for Adventure Classic Gaming, 15-Sept-2006. Interview with Brian Moriarty for Halcyon Days, by Dadgum Software. Radio With Pictures: Brian Moriarty. Interview by HM for Electron Dance, 31-May-2011. This page was last modified on 30 June 2016, at 17:40.